Please find below the two summary documents from the community meetings held on the Bruce Peninsula in 2018 and 2017..
Our hope is that these reports become working documents for communities. The ideas that we as a community can implement can be on everyone’s agenda, and those that require government or legislative changes, our leadership can take those ideas to those that can explore and possibly implement them. Thank you for your patience as we pulled this information together. Picture of Safe Communities “We Love The Way You Drive” (WLTWYD) event at Bruce Peninsula District School (BPDS) in Lions Head on Thursday, December 21, 2017. 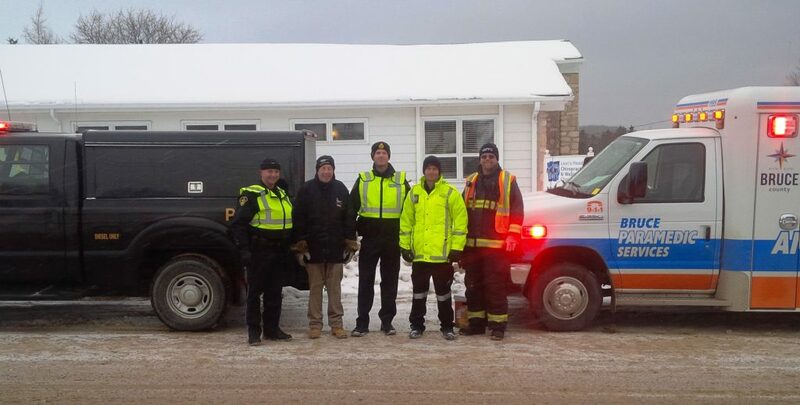 We had involvement from Staff of BPDS, Northern Bruce Peninsula Fire, Bruce County EMS and Bruce Peninsula OPP. Terry Bell attend as the Safe Communities Representative. It was well received by the students, parents and bus drivers. They are rewarded (candy…we give them candy). Into it’s third year the BPSCC has received significant feedback from the schools that the students enjoy the interaction and that the message of safer driving is clearly identified. Feel free to steal this idea for your area, we stole it from a high school in the US! The Bruce Peninsula Safe Communities Committee received its accreditation from Parachute Canada in May of 2017. The committee had been meeting for almost 2 years and had run numerous local initiatives that focused on reducing injuries and creating a safer community over all. The committee meets the first Thursday of each month and welcomes community partners to join.